With this leather shopper, I explore the tension between contrasting elements with strips of light and dark leathers that create a beautiful classic chevron pattern that is disrupted by a burst of bright orange color. This classic design pattern is modernized through shape, and with a turn of the wrist reveals the alternate side and a continuation of the experiment with contrast in yet another new and interesting way. 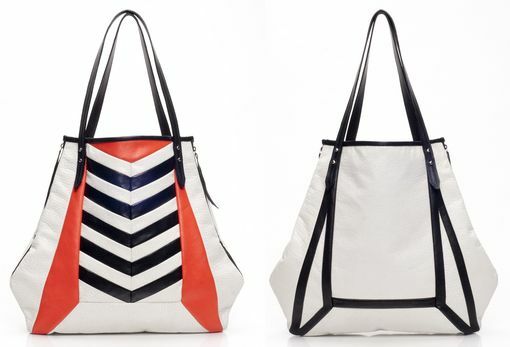 This bag could be made with different color combinations and textures.